Miss Singh: HOW TO BEAT THOSE WINTER BLUES! HOW TO BEAT THOSE WINTER BLUES! Let me start this post by saying that I am currently bundled up in a giant sweater, a blanket, a hot water bottle, some hot tea and my cuddly warm Chihuahua! The second thing I want to address is how much I hate winter! A fun fact about me is that I didn’t see snow until four years ago. I have lived in a hot climate all my life and winter was like fall. I know winter is awesome at first. We all have that holiday high. We all love it, because the first snowfall is gorgeous, all those Christmas celebrations and of course the New Year, but when all that is over, that waiting period hits, waiting for this weather to go away, the one that I call my winter blues! Did you know? An estimated one in five Americans suffer from SAD or seasonal affective disorder, often referred to as the winter blues. I have realized that I can’t change the weather and I have to cope with these months! I have a few tips that work for me, on how to beat those winter blues. Work Out/Exercise: I know this one is such a hard one to do! You rather just snuggle up in bed then put your work out gear on! I am not the gym kinda gal unless it’s the summer time, but it’s important to keep active and not be lazy. I like to do some quick and easy exercises and also walk a lot. Exercising can actually boost your feelings and help refresh your mind. A few fun snow sports could also be fun like ice skating and skiing, that will help you enjoy yourself while burning off those calories! Eat Smarter: Winter is the one time we all give in and binge eat(I literally have finished so much chocolate, its ridiculous!) But I decided to leave that and work on eating healthier. Its okay to indulge in a little chocolate here and there, but trying to cook some healthy stuff is going to make you feel better. Try out some new healthy warm recipes. I love quinoa and some soup! Soup is healthy, warm and so delicious. Quinoa is a much healthier option than eating rice. Quinoa has complete protein containing all nine essential amino acids and it tastes amazing, which is a plus! Planning: I think this is something that helps me the most. I like to plan and think about the warmer weather. I make plans for vacations and other activities that I will be doing in the spring and summer months! Scheduling events to look forward to is always a good idea! Take Up A Hobby/Project: Try taking up a fun hobby or class that interests you and you want to try out. Something that will keep you and your mind active, which is so essential in the winter time. If you’re not into the whole DIY projects/hobby thing, try taking up a project like cleaning out your closet and drawers and donating clothes. It is the perfect time to do it! Stay Warm: I know this can be an obvious one, but it’s really important to be bundled up because the more the cold hits you, the more irritable you get. Stay warm, drink some hot chocolate and snuggle up! I like to wear layers and at night I like to keep a hot water bottle with me to stay warm and cozy. Also, have some sleepy time tea or chamomile tea at night, it will keep you warm and toasty! Add Some Color: Color can be such a great way to bring some light to your life during these cold dreary months! I love that wintertime is the time where I can rock a red lip all the time! I also love some colorful statement jewelry and scarfs! I like to add pop of colors with beanies too. Music: Another huge one for me! I love listening to new music and it really changes up my mood. I like to discover new artists and listen to positive and happy songs, especially when I am walking to college. Music actually helps me forget about how cold it is outside because I am so into what I'm listening to. It is just a matter of time guys! This weather is going to pass by soon and spring and summer will be at our footsteps! I can't wait! 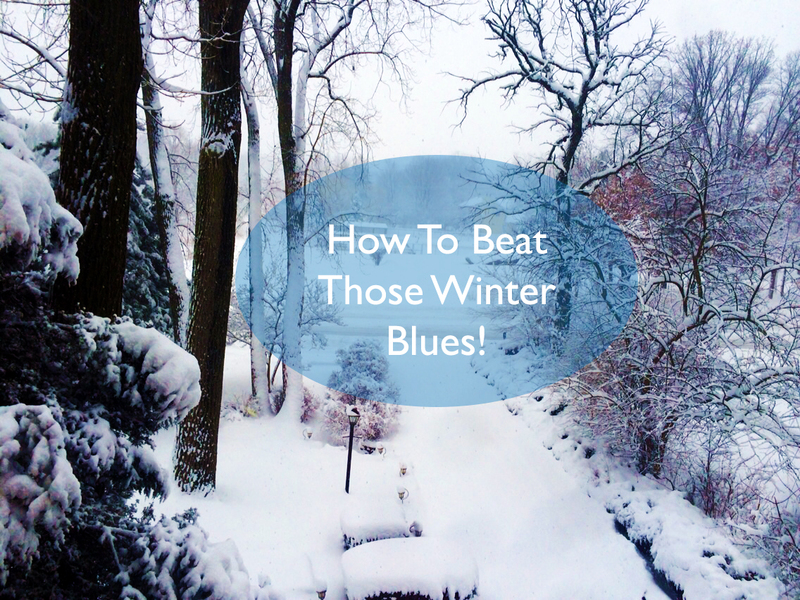 These are great tips on how to beat winter blues! Although I don't experience winter where I live I'm sure others can benefit from it! Thanks for sharing! Great tips! I'm desperate for spring, though! Haha! Exercise is definitely one to keep up through winder! Totally agree with you here. Great tips Hendra! I totally agree! :) Thanks for reading and sharing! I am too!! Hating this winter! Glad I could help!